Alexander "Sacha" Pechersky, a man beyond words. We tend to think that things today are as they have always been and always should be and will be. This is not so; we are conditioned by our conditions. Two stories to illustrate my point. Israel as the eternal home of the Jewish people welcomes our people back from the many lands of our exile and dispersion. We come home with much cultural baggage. 1970's. Jews begin to arrive home from the Soviet Union, the USSR. A man opens a shoe repair shop, just as he had back in Russia. My father works nearby and notices that he sits there, everyday, alone, with no customers. My father as a good caring man approaches him and wonders why the man is doing nothing to attract customers. The man replies; I am waiting for the government to supply me with my list of customers. He was conditioned by Soviet Communism. The government would assign him customers and these customers can only come to him. But of course this would not work in Israel. 1990's. Russian and Ukrainian Jewish women cannot understand Israeli men who bring things to repair shops. They are used to men who fix everything on their own. Amazed at this learned helplessness former Russian and Ukrainian men open watch repair shops, shoe repairs shops, appliance repair shops to satisfy this strange phenomena of men who can't fix things. In each case the people were conditioned by their environment, to act or not to act. A westerner understands he must market himself, or no one will come to his business. An Easterner understands that he must fix his own things because otherwise it will remain broken. We learn that there are certain things we must do for ourselves. Let me introduce you to a very special man, Alexander Pechersky. My cousin sent me a message and asked if I knew the name, he gave a hint, Sobibor. But of course! the leader of the great escape from Sobibor. You never heard of him? You never heard of Sobibor? As we say in Hebrew, Chor Ba Haskala, a hole in your education. Do not worry, I will educate you. During World War Two the Nazis, The National Socialists of Germany, established thousands of concentration camps throughout Europe. Many of them were pure Extermination Camps; sites designed as factories of death, a place to conduct mass murder of "undesirable" human beings. One of those camps was Sobibor. Sobibor was a German death camp located in occupied Poland. An estimated quarter of a million Jews were murdered there including Jewish soldiers from the Soviet Red Army. Things went smoothly until they brought in a Soviet Jewish soldier named Alexander Pechersky. You will want to remember that name. Perchersky was the kind of man who makes the movie fantasies look like a joke; Batman, Superman, Wonder woman, all mice and ants in comparison. If they ever make a movie about this man people will likely dismiss it as ridiculous Hollywood fantasy; it is impossible that such a man ever really existed, but he did. And he was more amazing that any comic book character. He was born on February 22, 1909 to a Jewish lawyer in the Russian Empire (now part of Ukraine). When the Germans invaded the Soviet Union on June 22, 1941 he was conscripted into the Soviet army. In his first act of heroism he rescued his wounded commander from being captured by the Germans. He received no award. October 1941 - His unit was surrounded and captured by the Germans during the Battle of Moscow. In prison he contracted typhus but survived the seven month illness. May 1942 - he escaped prison but was recaptured. He was sent to a POW camp near Minsk. Eventually he would be in camps in Vzazma, Smolensk, Borisov and Minsk; various circles of hell as he would later describe it. When the Germans discovered that he was Jewish they threw him in a cellar known as The Jewish Grave where he sat for ten complete days in total darkness being fed 100 grams of wheat and a cup of water every other day. August 20, 1942 - Sent to a severe labor camp, arbeitslager, where they were starved and worked from dawn till dusk. People died daily but Perchersky survived. 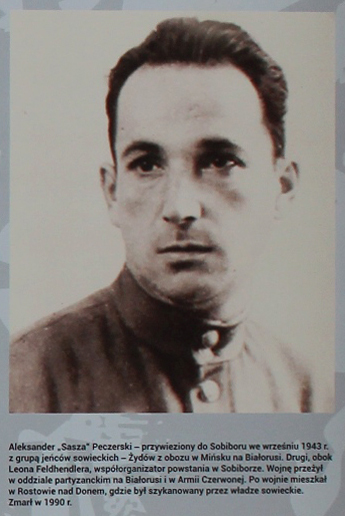 September 18, 1943 - Along with 2,000 Jews from Minsk he is sent in a cattle to the Sobibor extermination camp. September 23, 1943 - Arrival at Sobibor. When Pechersky and his Jewish Russian comrades arrived at Sobibor they were treated by the Germans as all other Jews, untermenschen, lower creatures. This was a mistake. Pechersky and the others were used to hardship and they were used to self reliance, team work and camaraderie. Within 22 days the uprising would take place and many of those arrogant Nazis would pay with their lives. Perchesky was using the principle we teach today; the best time to act is now. Do not wait for a better time, do not wait for outside help. Upon arrival Pechersky with 79 others were chosen for work, the remaining 1,920 Jews were led directly to the gas chambers. Pechersky understood that he was going through the many layers of hell but he would not give up. At once he began to plan his escape but decided not to do it alone. If you look at photos of Pechersky you will not find a resemblance to the movie heroes you are accustomed to. Imagine that! the movies and Krav Maga advertisements have not given you an accurate image of what a true hero looks like. That is because you would need an X ray into a man's soul. What characterized Pechersky and others like him where, in his own words, Vision, Hope and Commitment. Already on his third day at Sobibor Pechersky earned the respect of his fellow prisoners by boldly standing up to an SS officer. Again, this sounds like the stuff of movies, only it is true. Some prisoners were assigned to dig up tree stumps. When a certain Dutch Jew was unable to continue and the SS officer began to whip him. "Pechersky stopped chopping and watched the whipping while resting on his axe". A confrontation ensued in which the SS officer challenged Pechersky: Do the job yourself in 5 minutes, split the large tree stump in two. If you do it, you get a pack of cigarettes, if not - 25 lashes with the whip. Pechersky accepted the challenge and completed the task in 4 minutes. The SS man kept his word and offered Pechersky the cigarettes, a valuable commodity in prison. Pechersky said, "I don't smoke", turned around and went back to chopping tree stumps. The SS man then offered food but Pechersky said he was not hungry. Soon this prisoner will lead a revolt that saw 600 Jews escape camp and leave many Nazis and Ukrainian guards dead. During the initial discussion about the planned uprising a key point emerged, a divergence of world views. One of the Jewish prisoners asked, But why won't the partisans rescue them from Sobibor? The question perplexed Pechersky and he responded, Why should they? They have their hands full already. And here is the key point; "Nobody will do our job for us." This one sentence says it all. Pechersky's mentality was simple: Do it yourself, take the initiative and find others who will follow you, do not wait for others. Just think of his choice of words, Nobody will do OUR job for us. It is our job, no one else's. Only we are responsible. Contrast that with today's attitude where after every Active Shooting incidence the cry goes out: Why aren't others doing more for me? Why aren't others protecting me? Not only was Pechersky never recognized for his heroism but his post war troubles were as tragic as his wartime experience. He suffered greatly at the hands of the Soviet system. Often he was unemployed, persecuted and even arrested on suspicion of lack of loyalty to the system. Pechersky passed away in the USSR on January 19, 1990 at the age of 80. Finally in 2016 Vladimir Putin awarded him the Russian Order of Courage. May we be inspired by the example of this humble Jew. Ever dream of making a better version of yourself? Even wonder what it takes to have the qualities that makes one man rise above the others? Join us for Tour and Train Israel Experience, and experience that will change your life. Not only will you train in all aspects of Krav Maga. Yes, from beginner to advance you will deal with every situation imaginable; hand to hand combat, knives, handguns, rifles, sticks, on the ground, on a bus, in and around a car, airline safety and hostage situations but more than that! You will study the history of a nation that has fought back against all odds over a period of 3,000 and has survived! There is no other program like this. We will personally guide you to sites of military, historical and religious significance. You will see and feel from the perspective of those who live here, who fight here. 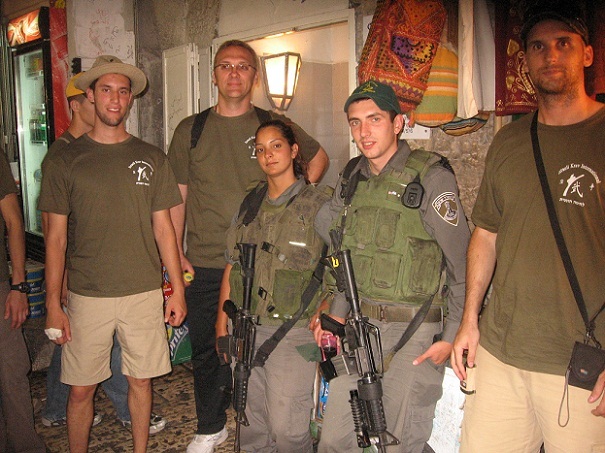 Members of IKI Krav Maga Tour and Train meet and mingle with Israelis who are living the dream: Standing guard and keeping Jerusalem safe for all. Meet the people who are making the change.